Since 1976 The Matassini Law Firm, P.A. has been assisting victims of medical malpractice seek just compensation. We frequently get questions from potential clients and would like to share some of the most common. Medical malpractice is negligent treatment by medical providers, such as a doctor, hospital, nurse, chiropractor, therapist, or other medical practitioner. If a medical practitioner fails to act in accordance with accepted standards of practice in the diagnosis or treatment of a condition, they may be responsible for all damages that result, including pain and suffering, medical bills, loss of wages, or a death. 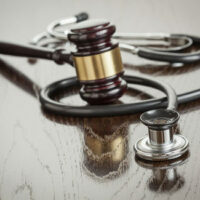 Should I consider a medical malpractice lawsuit if I have had a bad result? It depends; a bad result may or may not indicate medical malpractice. Simply because a patient experiences a medical complication that does not necessarily mean that there has been malpractice. A bad outcome may be what prompts the client to contact an attorney, but further investigation needs to be done to determine if in fact there was malpractice. The only way to truly know if a bad result or a complication is due to medical malpractice is to consult an attorney with experience in this area. The attorney will then do an investigation and have the matter reviewed by a competent expert. And that truly is the only way to know if you have a medical malpractice action. An important point to make is that there has to be some level of serious or permanent injury in order to really have a viable lawsuit. This is because medical malpractice cases are very complex and expensive to prosecute. So the injury must merit going forward with a costly and time-consuming lawsuit. For example, a doctor can prescribe a wrong medication and you can take that medication and maybe feel dizzy for a couple days, but there is no serious, permanent injury. In that case, we would advise against filing that lawsuit. While the doctor may have not complied with the standard of care, there is not a damage of a sufficient quantity there to merit the time and expense of a lawsuit. Is there a specific time period within which I have to pursue my medical malpractice claim? The strict procedural requirements in the Florida Comprehensive Medical Malpractice Reform Act reflects a legislative determination to curtail frivolous claims, promote settlement, and reduce the high cost of medical malpractice insurance. To this end, the two-year statute of limitations serves as a potential bar to causes of action by claimants of medical malpractice. Under Florida law, ordinary negligence causes of action are subject to a four-year statute of limitations. However, following an increasing trend among other states, Florida has codified a two-year statute of limitations for medical malpractice causes of action, with a four-year statute of repose, and a seven-year maximum cap for cases that involve fraud, concealment, or intentional misrepresentation by a prospective defendant health care provider. The only exception to this is when the claimant is a minor age eight or younger, in which case the seven-year period does not bar an action brought on behalf of a minor on or before the child’s eighth birthday. Example 1 – A patient has severe headaches and goes to the local Emergency Room. The ER doctor there fails to do a required standard test that would have disclosed the presence of a weakened blood vessel in the brain. If detected, the weakened blood vessel could be easily repaired by surgical procedure. Because the doctor didn’t do the standard test, the vessel ruptures, and the patient dies. The doctor and hospital would be responsible for the losses to the family, including loss of the support, love, and comfort that the decedent would have provided. Example 2 – During an abdominal procedure, a surgeon becomes distracted and cuts into the patient’s liver, seriously damaging it. A review of the case by other surgical experts demonstrates that in her distraction, the doctor failed to follow accepted protocols and procedures. The clinic would be liable for the medical bills, pain and suffering, and loss of wages that result. Example 3 – A patient goes into the hospital to have a mammogram, a standard breast examination. The radiologist reads the resulting x-rays, but mixes up her report with another patient’s. As a result, the patient is told she has advanced breast cancer and needs to have her breasts removed immediately, when in fact, her test was perfectly normal and therfore no procedure was warranted. The doctor and hospital are responsible for the resulting surgical costs, infections, loss of wages, disfigurement, and other damages that result. When should I suspect that medical malpractice might have occurred? Sometimes, the presence of medical malpractice is obvious, such as example 3 above. However, the mere fact that the result of a surgery or treatment is not what the doctor predicted or expected does not necessarily means that medical malpractice has occurred. Rather, anytime a person learns that a doctor, hospital, nurse, chiropractor, or other medical provider did not follow accepted medical procedure, they should be concerned that medical malpractice has occurred. Quite often, the presence of a medical practice case can only be learned through consultation with an attorney experienced in handling medical malpractice matters. As noted above, it can be difficult for a layperson to determine if medical negligence occurred. That is why it is frequently necessary for the family to retain an experienced medical malpractice lawyer and his team to review the voluminous medical records, diagnostic studies, and other relevant information necessary to determine whether the medical provider was negligent. Should I report a suspected act of medical malpractice to any state or professional organization or institution? Yes, of course. If you have reason to suspect that a medical institution (hospital, surgery center, walk-in clinic, etc.) or medical professional (doctor, nurse, or other medical provider) has failed to act in accordance with the requirements of standard medical practice or other professional obligations, then this should be reported to the state medical practices board or other appropriate entity. The authorities need to know! Contact Tampa Bay Injury Lawyer Nicholas M. Matassini, AV Rated by Martindale-Hubbell, for a free, confidential evaluation of your potential medical malpractice claim.